Ballymena United's Eoin Kane holds off Linfield's Matthew Clarke during Saturdays fifth round Tennent's Irish Cup game at Windsor Park. Picture: Press Eye. Ballymena United bowed out of the Irish Cup after losing 2-1 in extra-time in a dramatic Tennent’s Irish Cup tie at Linfield today. 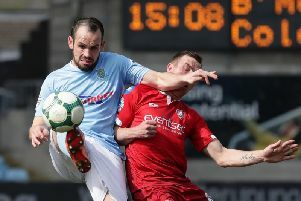 Gary Thompson’s second half goal had cancelled out Andrew Waterworth’s first half opener to force the game to extra time at the National Stadium. Ballymena looked to have the upper hand in extra time after Linfield striker Paul Smyth was sent off but Guy Bates headed the winner for the Blues with five minutes left, while Ballymena also fiished with 10 men following the last minute dismissal of defender Johnny Taylor. United boss Glenn Ferguson made two changes from the New Year’s Day win at Portadown with Gavin Taggart replacing Gareth Rodger, who has returned to St Johnstone, while Willie Faulkner returned following a broken arm to replace Stewart Nixon, who dropped to the bench. LInfield made most of the early running, with Ballymena defending resolutely in front of their travelling fans in the Railway End of the redeveloped ground. The Blues came close to opening the scoring on 11 minutes as defender Chris Hegarty’s volley from Niall Quinn’s inswinging corner came off the outside of Alan Blayney’s post. Quinn’s set piece prowess was again put to use by the home side on 16 minutes when his free kick from 25 yards went narrowly over the crossbar. Quinn then orchestrated Linfield’s next move with a clever ball isndie from the left wing which saw Matthew Clarke get in on the wrong side of Willie Faulkner but as the winger bore down on goal, his low shot was smothered by Blayney. Linfield continued to have the upper hand and Andy Waterworth easily turned Johnny Taylor just outside the penalty area but his fierce angled shot was beaten out by Blayney with David Cushley clearing the loose ball. Ballymena created little in the way of clear-cut chances with Gary Thompson’s effort sailing over, while David Cushley’s long-range strike from a free kick only succeeded in hitting a dump truck in the building site behind Ross Glendinning’s goal. On the stroke of half-time, Kirk Millar played in Smyth but his angled shot was deflected to safety. But the Blues went ahead a minute and eight seconds after the restart. From an attack dwon the left, Matthhew Clarke’s shot deflected off a defender and fell to Waterworth 12 yards out and his rising drive found the net via the hand of Blayney. Linfield immediately upped the ante as they pressed for a second goal but in a rare Ballymena attack, Cushley nodded just wide from a Tony Kane free kick. Cushley then saw a fierce volley blocked by Jimmy Callacher, with Tony Kane firing the rebound over, as Ballymea belatedly began to show signs of an attacking threat. But their effort were almost undone at the othyer end when keeper Blayney dropped a routine Kirk Millar cross inside the six yard box, only for the danger to be cleared by alert full-back Eoin Kane. And that proved crucial as Ballymena forced an equaliser on 64 minutes. After a corner hadn’t been cleared, Tony Kane’s low cross from the left was deflected towards his own goal by Niall Quinn only for Sean Ward on the goal-line to brilliantly keep it out, but the ball eventually popped up for Gary Thompson to head home from close range. As the game ebbed and flowed, United substitute Nathan Hanley saw his fierce drive brilliantly blocked by Linfield’s Kirk Millar and Hanley then had another effort hacked off the line by Jimmy Callacher in a frantic finale. Linfield intoduced Guy Bates at the start of extra time and the burly striker had an early chance but his effort was kept out at point-blank range by Blayney and the same two players were involved minutes later with Blayney using every inch of his long reach to brilliantly palm away Bates’ curling effort. The game took a further twist on 103 minutes when Linfield’s teenage striker Paul Smyth, already on a yellow card, picked up a second booking for a lunging tackle on David Cushley. But the Blues weathered the United storm and it was the home side who grabbed the decisive goal on 115 minutes. It came after Ballymena were caught on the counter-attack as they searched for a winner themselves, leaving a gap at the back which saw Linfield move the ball to the right wing where Kirk Millar swung in an inch-perfect cross for Guy Bates to finally beat Blayney with a diving header. Ballymena’s frustration was compounded in the final minute of extra time when Johnny Taylor was given a straight red card after appearing to kick out at an opponent in the middle of the pitch. It means the defender will now miss Tuesday night’s County Antrim Shield final between the sides at the same venue. Linfield: Ross Glendinning, Hegarty (sub Reece Glendinning 67), Haughey, Callacher, Quinn, Millar, Ward (sub Gaynor 82), Mulgrew, Clarke, Smyth, Waterworth (sub Bates 91). Subs (not used): Deane, Kee. Ballymena United: Blayney, E Kane, Ervin, Taylor, McBride (sub Hanley 63), Taggart (sub Shevlin 70), Thompson, T Kane, Faulkner (sub Nixon 106), Cushley, Jenkins. Subs (not used): Nixon.